El Anatsui’s _TSIATSIA – Searching for Connection_ (2013) will adorn the RA’s facade for the duration of this year’s Summer Exhibition. Like Wimbledon and the Proms, the Royal Academy’s Summer Exhibition, now in its 245th year, has long since gained the status of a British institution. Which is not to say that all of the 1000 plus works included in the exhibition are equally establishment-friendly – either in aesthetic or in tone. 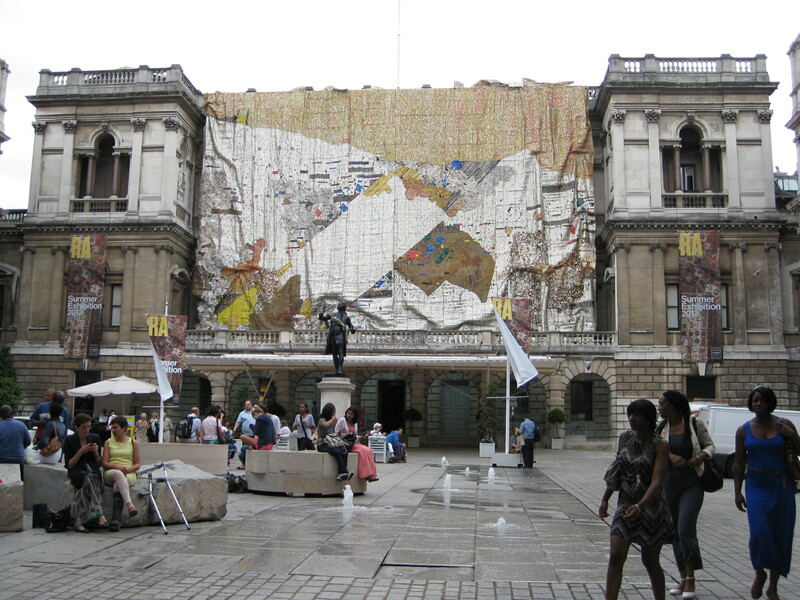 In recent times, the Royal Academicians responsible for the show have worked hard to refashion its image, making a concerted effort to attract younger, emerging artists and this year commissioning the monumental TSIATSIA – Searching for Connection from El Anatsui, the Ghanian-born artist active in Nigeria. The fruits are perhaps now beginning to appear, with, for example, the number of video works rising in 2013, following the medium’s maiden incursion into last year’s show. Still, it’s striking that the pieces which do most to trouble the RA’s reputation as a haven for Sunday painters come from an older generation of artists: Grayson Perry’s quick-witted, tapestry-borne commentary on class and taste (The Vanity of Small Differences), for instance, or Maggi Hambling’s incisive vision of the nexus of fanaticism and violence (War Zone). Fans of more traditional British fare needn’t despair, however. This year’s Summer Exhibition also comprises new works by Anthony Caro (Shadows, a colossal steel construction, at once stark and theatrical) and Albert Irvin (Fidelio, a large abstract painting full of joy and rhythm) as well as, by way of a tribute, five oils by Mary Fedden, the much-loved RA who died last year. In sum, if you can cope with the somewhat crowded and sometimes outright chaotic hang, the show (until 18 August) provides a good opportunity to get to grips with contemporary British art in all its diversity and to decide for yourself what’s worth spending time contemplating and what wouldn’t have made the cut had you been on the judging panel. Whereas the Summer Exhibition’s philosophy is doubtless one of inclusivity, historically the art world was rarely so charitable towards artists whose practice fell outside the prevailing norms of medium and/or style. There is hardly a more oft-cited example of a British artist whose work, though popularly adored, has been neglected by successive generations of critics and art historians than Laurence Stephen Lowry (1887-1976). Whether or not you subscribe to this version of events (and there are persuasive arguments both for and against), it is certainly true that it is only now that the Lancastrian painter and draughtsman is, finally, getting the Tate treatment, with a survey of his industrial landscapes at Tate Britain until 20 October. The show’s title riffs on Charles Baudelaire’s essay of 1860, ‘The Painter of Modern Life’, a meditation on the art of Constantin Guys which helped, when published in 1863, to make sense of work by the period’s emerging ‘Modern’ artists: Manet, Degas et al. In this vein, the Tate show, curated by renowned art historians T. J. Clark and Anne Wagner, seek to reposition Lowry as an artist whose urban scenes recast his contemporaries’ sense of the modern – in part through their working-class subject matter but also because of their coupling of realist and Impressionist traits. In contrast to Lowry’s default position as ‘outsider’, two other artists receiving overdue attention this summer played rather more active roles on the early- and mid-20th-century British art scene. Christopher Wood – to whom Kettle’s Yard dedicates the fourth exhibition in its ‘Artists in Focus’ series – befriended Ben and Winifred Nicholson, Alfred Wallis and various members of the Parisian avant-garde in the 1920s, before his death aged just 29 in 1932. This new exhibition (to 1 September) brings together paintings and drawings from the University of Cambridge and Kettle’s Yard collections, many of which are not normally on display, with archival materials to offer new insight into the artist’s life and work. Laura Knight Portraits, at the National Portrait Gallery until 13 October, celebrates this popular and in some ways pioneering artist, with a small-ish but varied selection of her paintings of well-known figures and her official War Art. Artistic friendship is the theme underlying Dulwich Picture Gallery’s latest show, Nash, Nevinson, Spencer, Gertler, Carrington, Bomberg: A Crisis of Brilliance, 1908-1922 (to 22 September). The exhibition sets out to demonstrate what it was about the art of the six artists mentioned in the title, contemporaries all at the Slade between 1908 and 1912, that led their teacher Henry Tonks to designate them the school’s ‘last crisis of brilliance’. Brilliance, it is shown, refers to the artists’ innate talent, discernible even at the early stage of their careers that their time at the Slade represented. Crisis, meanwhile, encompasses both the Great War (and the turbulent political period preceding it) and the dramatic shifts in art in the first decades of the 20th century. Keep a particular eye out for works by Paul Nash (including Void, one of his First World War oil paintings) on loan from the National Gallery of Canada and on display in the UK for the first time in a number of years.